Ferguson fallout: Cameras on cops? A tiny company that makes wearable cameras for police officers is back on Wall Street's radar. Shares of Digital Ally (DGLY), which were trading below $4 the day before unarmed teenager Michael Brown was shot and killed by police officer Darren Wilson in the St. Louis suburb of Ferguson, surged to a high of $33.59 just after Labor Day. Digital Ally's stock has since fallen sharply from that peak. But shares rose more than 3% Friday and soared another 12% Monday as the nation waited to find out if a Missouri grand jury had decided to indict Wilson. Why did the stock pop in August in the first place? Investors seemed to be betting that the events in Ferguson could lead to more demand for Digital Ally's FirstVU HD body worn cameras. Having official video evidence could make it easier for juries (and the general public) to figure out exactly what happened in a disputed shooting. Digital Ally even said in its third-quarter financial report that it "noticed a substantial increase in body camera test and evaluation programs by police agencies since widely publicized social unrest erupted in Ferguson, Missouri in August 2014." But Digital Ally reported sales of only $4.7 million in its most recent quarter and racked up a $6.2 million loss. The stock is incredibly risky. 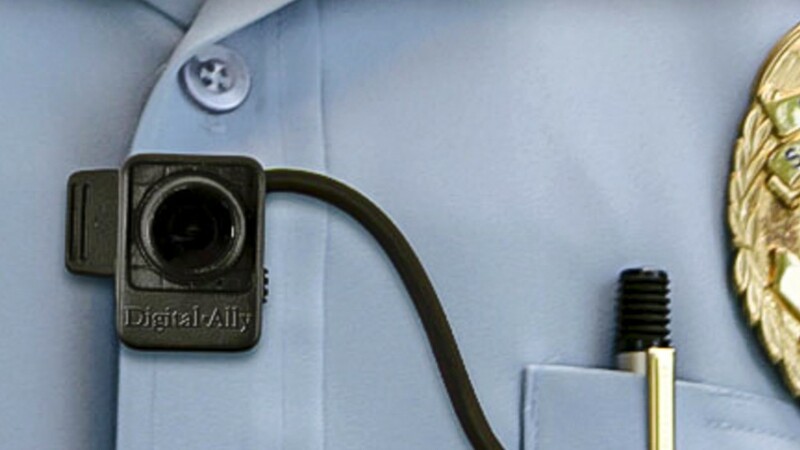 Even if more law enforcement agencies do decide to purchase wearable cameras, it's not as if Digital Ally is the only company that makes them. Taser (TASR), most famous for its brand of stun guns, has also developed a wearable camera called the Axon. Taser is a larger and more stable company than Digital Ally. It reported sales of $44.3 million in its most recent quarter and is worth more than $1 billion. Digital Ally's market value is only $38 million. No financial analysts cover Digital Ally and the stock is not widely held by any major mutual funds or hedge funds. And unlike Digital Ally, Taser is profitable. All this suggests that Digital Ally is a stock that day traders are moving in and out of pretty quickly while Taser has more going for it than just headlines about Ferguson. 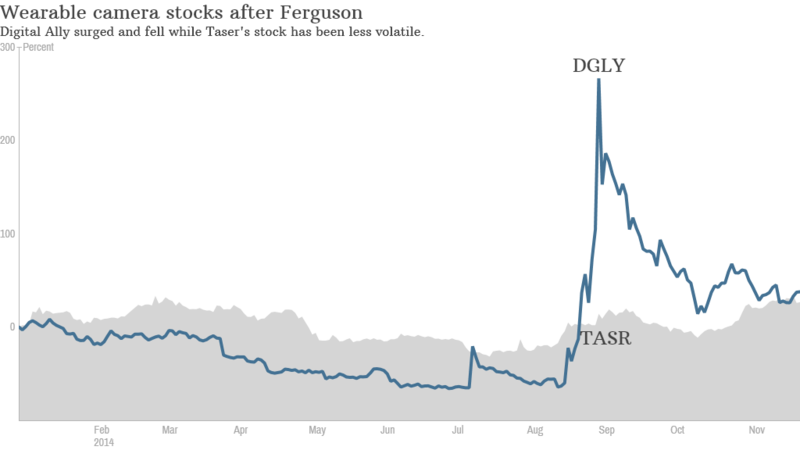 Yes, shares of Taser also got a bump in August when Ferguson dominated the headlines. But its stock hasn't cooled off as dramatically as Digital Ally's. "Regardless of what the grand jury decides, police departments are already pursuing more cameras on their officers. But Digital Ally has done little with its on-officer video business," said Steve Dyer, an analyst who covers Taser for Craig Hallum Capital Group. "They haven't won any deals of any magnitude. We don't view Digital Ally as all that serious a competitor to Taser." Still, another analyst suggests that it's not clear how much demand there will be for wearable cameras for police officers. Brian Ruttenbur, who follows Taser for CRT Capital Group, noted that it may be prohibitively expensive for some smaller police departments to purchase this technology. And in some states, public disclosure laws make it easy for people to request footage from video cameras worn by police officers. Ruttenbur noted that there is one person in the state of Washington who has been making a request for a large amount of footage and is posting it on YouTube. That may make some police departments reluctant to adopt the technology, Ruttenbur said. So there may be unintended consequences from having cops wear cameras. In other words, investors should do their homework before jumping into any wearable camera company. Buying a stock solely based on what the grand jury does in Ferguson is a terrible idea.